It's been a discount aisle spree recently, and that trend continues today. Today's retail product is purely baseball and comes from Leaf. It celebrates a player that baseball has tossed out of the game completely - Pete Rose. The box is guaranteed to either have an autographed card or a redemption for an autographed memorabilia card. Sounds like a good deal! I grew up in the 1980's, and I remember Pete Rose well. He was a tremendous competitor, someone who had a killer instinct. And that was a trait I really admired, and still do. Michael Jordan had that in him... and so did Pete Rose. Unfortunately, Rose was caught betting on baseball, and he was banned from the game. You will not find any officially licensed products with Pete Rose. Major League Baseball will not allow it, so third party companies like Leaf step in and produce sets of his. Rose has signed for both Leaf and Upper Deck. I've always wanted his signature, and this was a pretty nice way to get it - and cheap! Just for good measure I also purchased a single pack of 13/14 Upper Deck Series 2 hockey. There's always a chance that a Young Gun card is lurking inside. 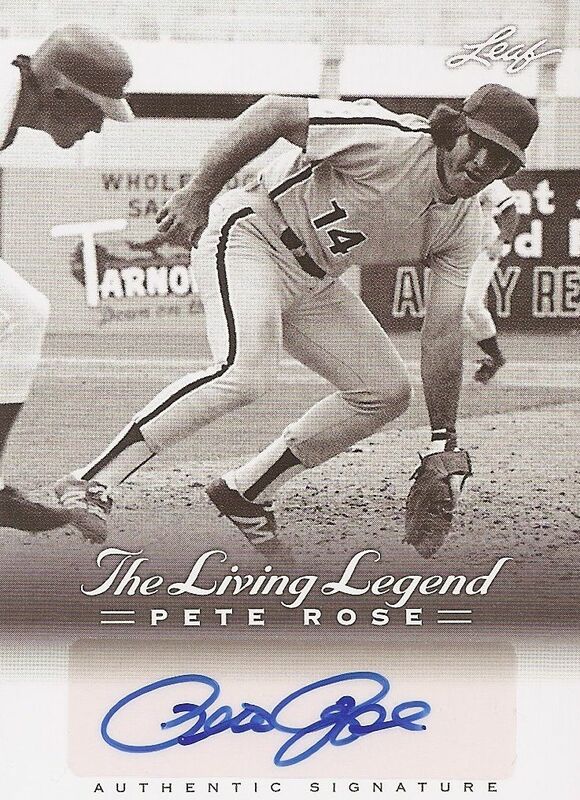 The Pete Rose Living Legend cards are nice. The cards are all black & white and come on a classic feeling cardboard. The set is very well done, and features some very unique photographs. For a tribute set, Leaf has done a wonderful job. The feeling it evokes with it's style - from the fonts to the photos - is perfect. Collectors who remembered Pete Rose from way back when should enjoy this set of cards. With the Upper Deck pack, unfortunately there was nothing but base. I guess that's ok. You can't get something every time. I did, however, get a couple of San Jose Sharks... and that's always good. Upper Deck and Leaf both share something in common with these products - outstanding photography. As someone who appreciates a good photo, both these products delivered well in that area. This card is always a stopper when you pull it. It's such a fearsome card! 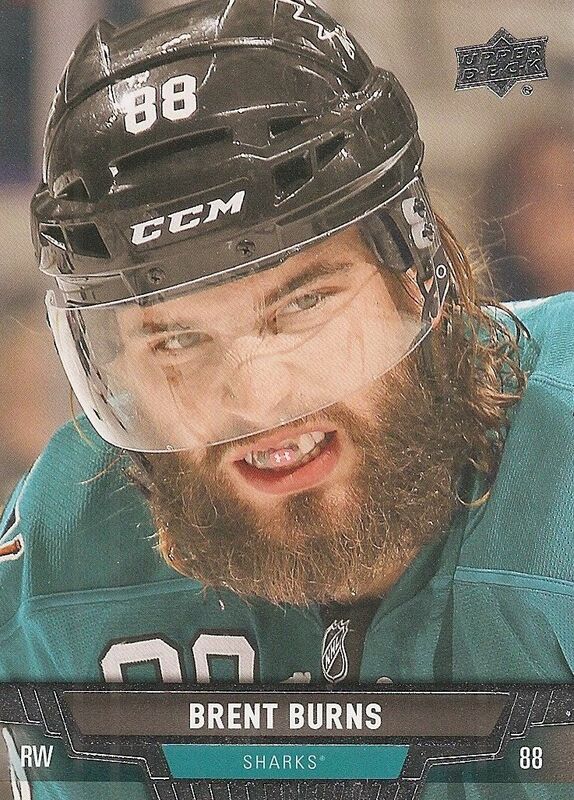 I've spoken about this particular card before, but it has to be one of the best photos out of Upper Deck this year. 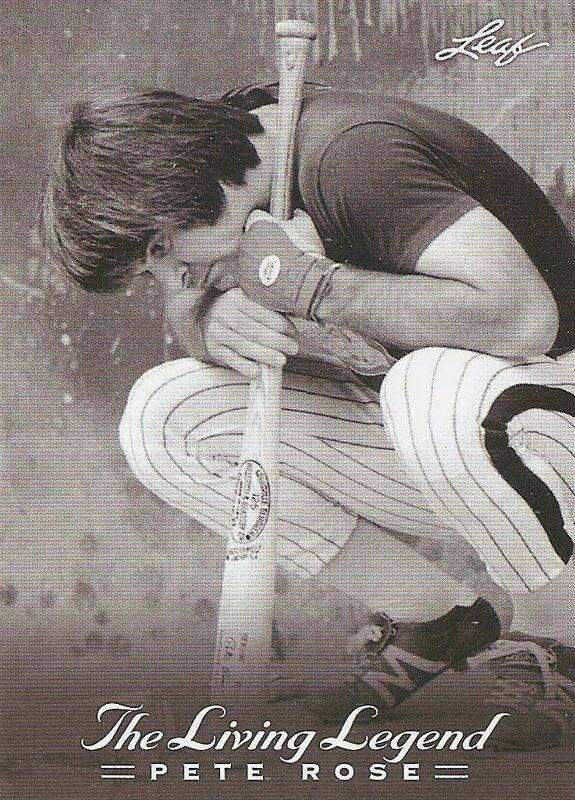 Another photo that caught my eye from this break came from the Pete Rose break. Here we see Charlie Hustle in a more contemplative mood. He was always so intense, and this photo has that dialed down a bit. Of course the top card of this break had to be the autograph. Too bad it's a sticker auto, but that's ok... what can you expect out of a guaranteed auto box for the price it was at? The blue ink does work well with black and white though! For the price I paid, I think I did well. $12.99 was not the original price of the Pete Rose blaster. It probably was around twenty dollars. But at this price it's good. 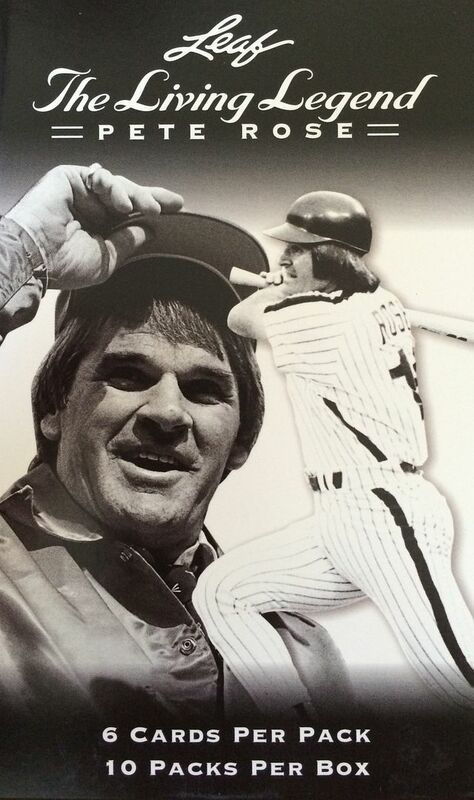 Pete Rose is a player that should be in the baseball hall of fame. One day he might actually be. Rarely do you get a guaranteed autograph of someone who was so good in a box at retail. If I saw these again, I would actually consider getting another one as there are many different autographs to get... and of course there's the chance at a memorabilia autograph as well. I wonder if a big Pete Rose fan has put together then entire set of autographs. That would be something!